Without a doubt, cravings for sugary or starchy food are one of the most challenging things to overcome when you’re trying to transition to a whole food plant-based diet. In our experience, willpower can only take you so far before you give into those old familiar processed comfort foods. Why do we crave what we do? Because our body is missing or is low on an important nutrient. Sweet cravings are often caused by low-energy or fatigue, and dehydration. It’s a survival signal for quick energy. When your blood sugar is low, your brain signals an urgent need for sugar. When your muscles are glycogen-depleted (this occurs when we run out of glycogen stores because of lack of food or intense exercise) you experience a craving for carbs until the muscles are adequately replenished. You can satisfy your cravings easily, by choosing healthier alternatives that supply you with the key nutrient your body is craving. 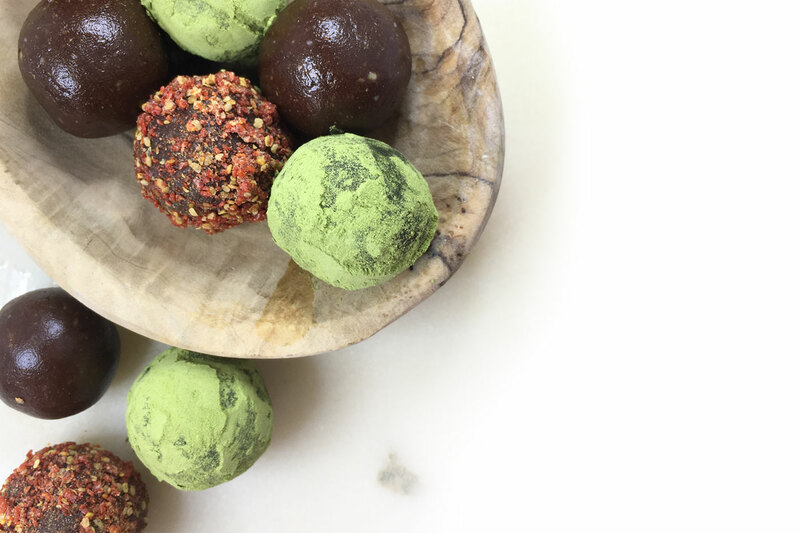 These Superfood Truffle Balls are a great option for satisfying your sweet tooth and for putting cravings in their place. They are also an easy way to pack a great deal of nutrition into a delicious and convenient form. We eat a few of them a day, so we make a big batch at one time and store them in the freezer. They are so easy to grab as you head out the door. Also, these truffles will not freeze solid, so you can eat them straight from the freezer—no thawing required! These truffles are the healthiest and among the easiest and least time- consuming snacks to prepare. No cooking is required—only a food processor. As you can see from the recipes, they are packed with wholesome ingredients that will provide nourishment, deliver sustainable energy and satisfy your sweet cravings. Add pitted dates + all remaining ingredients and process until a dense dough has formed. Remove the mixture from the food processor. To shape into balls, use a tablespoon or your hands to scoop the mixture (however much you like to make one ball); roll between the palms of your hands. Place on a plate and refrigerate for a minimum of 1 hour before serving. 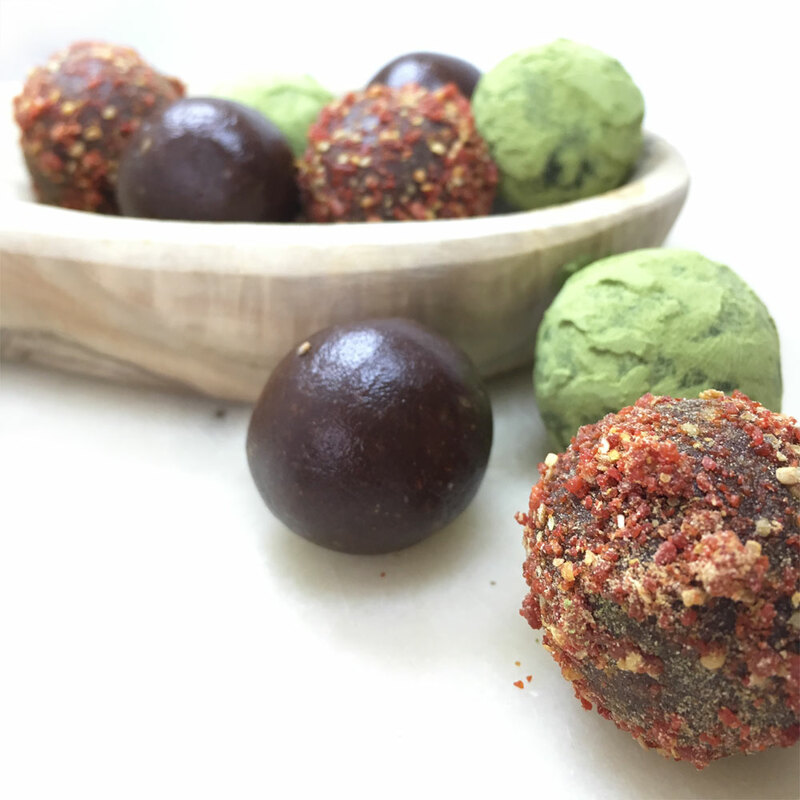 Optional: Roll truffles in a plate of superfood powder to duct exterior before refrigerating. If you have the time we highly suggest you pre-soak the nuts before using. Looking for more healthy, plant-based treats? 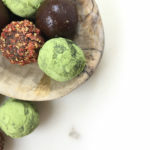 Then check out some of our favourites – Raw Superfood Energy Bites, Vegan Pecan Turtles and Vegan Chocolate Salted Caramels.